LEDs are well-known for the ability to produce bright, white light with less wattage than traditional bulbs. Yet, when it comes to buying LEDs, there is more to take into consideration than the watts your saving. It is important to take to consider existing lighting, lumen count and how to convert traditional wattage to LED wattage correctly. Footcandles are important, maybe more so than wattage, when it comes to replacing old bulbs for LEDs. If you try and replace a 60W incandescent light with a 60W LED, you will end up with too harsh of lighting. 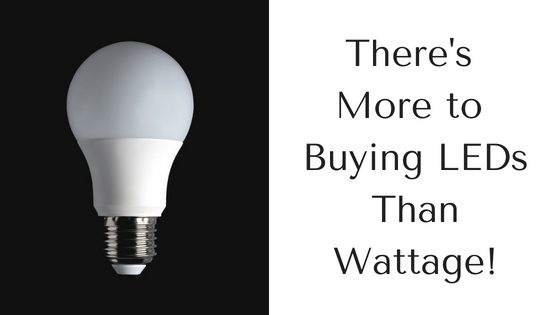 Wattage only tells the consumer how much power the bulb uses, not how much light it outputs. A way to measure the light thrown from a bulb is in footcandles. Footcandle measurement predates the light bulb, going all the way to when the standard of lighting was, you guessed it, candles. Today, one footcandle is approximately one lumen per square foot. Once you know how many footcandles are needed to properly light a space, you can convert that into lumens, which can help you find a more appropriate bulb for your home, office, factory, and more! With traditional lighting, the higher the wattage, the brighter the light. This is not the case with LEDs. When looking for LED lighting, you should look to the lumen count to determine brightness rather than wattage. Wattage is used to measure power needed. The more power a traditional bulb uses, the brighter the light. LEDs are able to use much less power and create a much brighter lumen output. Today, you can replace a 40 Watt incandescent light with a 4 Watt LED and reach the same lumen output! When you work with Sitler’s to replace existing bulbs with LEDs, we help you determine the right type and number of fixtures to light your space, but not overpower it. We make the process of converting traditional wattage and lumen count to LED watts and lumens, so you aren’t stuck doing the math! You can receive your free walk-through and assessment today by calling (319) 653-2123 or requesting a quote online!